Sending flowers on Mother's Day (this year it's on Sunday 11th March) could be perceived as a bit of a cliché but I honestly don't know anyone that doesn't like flowers or plants. With so many different options around at the moment - from flowers, succulents and vintage vases - there really is something for everyone. I've never been that green fingered and always so jealous of my mum who is! So when Marks & Spencer recently invited me to their Mothers Day Flower Masterclass, I jumped at the chance to come along and pick up some top flower arranging skills, tips and hands on practice with their expert team and floral blogger Rona Weeldon (Flowerona blog). Marks & Spencer really do have the most stunning selection of affordable flowers and bouquets and they try to get as much from the UK as possible which is nice to hear. They have a really useful flower arrangement tips hub on their website that is worth a look at, including advice on how to choose the right vase and care properly for your flowers. Did you know that peach and apricot are the big colours for flowers this year? Or that by getting rid of any leaves below water level and putting them in a cool place before you prepare them will make them last much longer? I spotted this really cool Trio of Rose plants that have been cleverly designed to fit through your letterbox and I've seen this huge bouquet of Pastel Avalanche Roses in real life and it is simply stunning if you really want to splash out. A nice alternative to flowers is also this Herb Crate, perfect for the kitchen and will hopefully last longer than flowers! Depending on your personality and style you really can come up with something to suit you or who you want to send them to. Personally I'm a fan of more of a natural and wildflower look with peonies (wrong time of year at the moment) being my all time favourite flower. I also love succulents and foliage for bringing some greenery into my home. Bright pinks always look striking too, great back with green. These are my Mother's Day Blooms ideas which you can create at home using Marks & Spencer flowers and homewares. 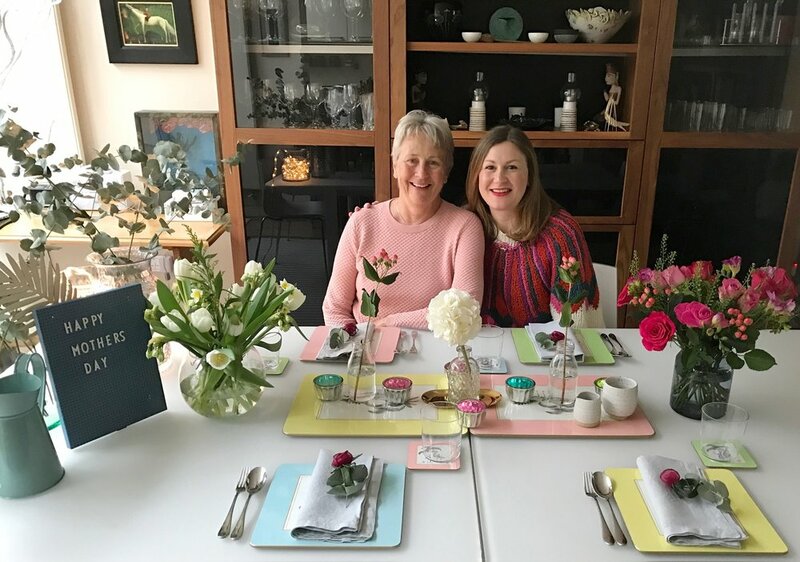 I love the idea of doing a Mothers Day Brunch or Lunch table setting which I have done here for this blog post, set up at my mum's house. For this table display below, I used a Scented Spring Posy, a Rose and Freesia Gift Bag, Small Apothecary Vase, Medium Pressed Diamond Vase, Alium in a Vase and Tall Pressed Diamond Vase (all from M&S). I took a few buds from the rose and freesia bouquet and popped them in some old milk jars for a more deconstructed look. The alium in the vase on the centre of the table is actually a faux flower! I love the selection of faux flowers and vintage style vases M&S do too. I also used some fairy lights in one of the pressed diamond vases and some eucalyptus branches in the larger vases to create a bit more interest and drama! So if you want to order a pre-made bouquet or simply have a go yourself like I have, do check out Marks & Spencer this Mothers Day. There is free nominated delivery on all flowers and plants. This post has been commissioned by Marks & Spencer but all ideas and views are my own.